I visited this trig beacon recently during cloudy weather. Whilst the views were no good from the hill top in such wx this image has a moody sort of appeal? In clear wx there are very good views from Mt Greenland and that is especially the case in winter. Being offset from the main divide you get panoramic views. The easiest way to walk up Mt Greenland is to follow the old miners road from Ross. Beyond a couple of km which has been maintained it is now beyond the capability of most 4x4 vehicles to make it up there. Walking this way takes c. 3 hours from Ross. Trampers wanting to go further could walk to the Mt Greenland Hut another 2km beyond the trig beacon along the 4x4 track. This hut is available for overnight stays and is quite tidy with mattresses, running water etc. 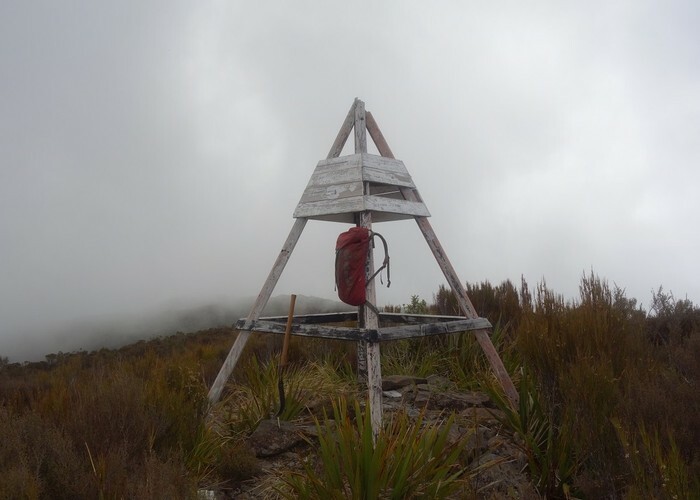 More adventurous types can visit the Greenland trig or hut from the Totara or Mikonui catchments making use of overgrown miners tracks and bush ridges. There are public huts in the Totara and Mikonui. Added 26 November 2017 by glennjglennj. No revisions.